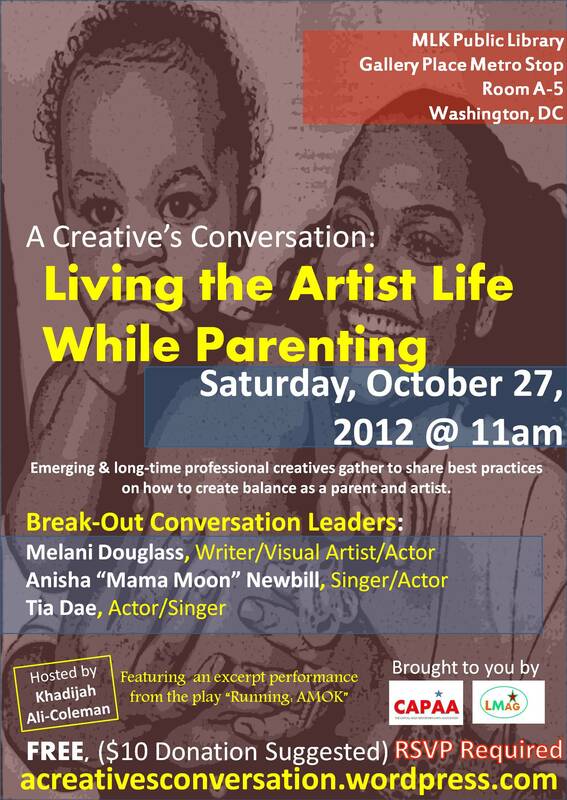 Join us for the first CREATIVE’S CONVERSATION on Saturday, October 27, 2012 in Washington DC. The topic will be “Living the Artist Life While Parenting” with break-out conversations led by talented multi-tasking mamas making art while raising babies. A conversation forum for ALL CREATIVES who are new parents, soon-to-be parents, planning-to-be parents down the road, empty nesters or parents to school-aged children. Let’s talk! A space of comfort, fellowship & inspiration, normalizing the reality of work/life balance for artists. Featuring an excerpt from the play “Running: AMOK“.